In the early morning hours of Sunday, April 9th, 2017 the Bethpage Fire Department was dispatched to a report of a house fire on North Baldwin Drive north of North Kentucky Avenue. As units began responding they were advised by nine zero zero dispatch that the address was being revised to 325 North Kentucky Avenue as per a second call received. When firefighters arrived on scene they quickly discovered that they had heavy fire at the rear of a two-story private dwelling leading to the request for a FAST. 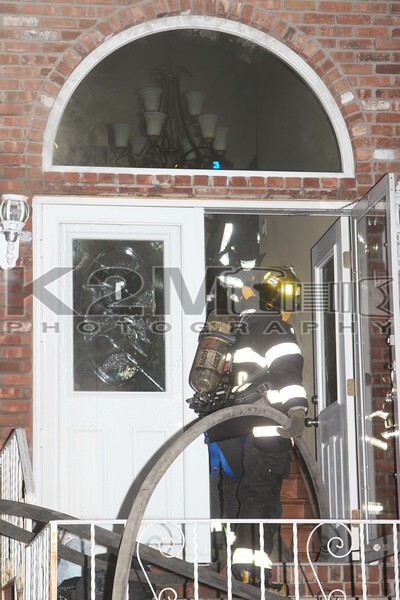 Farmingdale responded with Ladder 926 for this role and not long after the FAST was requested came the transmission of a signal ten [working fire]. Bethpage Engine 9055 was the first engine company to arrive on scene utilizing a hydrant in front of the home. At least two hand lines were stretched and put into operation to fight the fire. Additional mutual aid to the scene consisted of Levittown Ladder 626 and South Farmingdale Engine 971. Firefighters made a quick knockdown of the fire. All occupants made it safely out the home and firefighters even removed a large cage with birds that survived the fire. The cause of the fire is under investigation and all fire department units were under the command of Bethpage Chief of Department DeBobes [Car 1].